The Michigan Democratic primaries on Wednesday proved a mixed bag for Muslim candidates who were endorsed by a mixture of Islamist organizations and members of left-most elements of progressive politics. Yet despite the less than stellar polling results, there’s reason for concern that efforts to legitimize Islamist politicians will continue. Abdul El-Sayed, a dark-horse gubernatorial candidate who has been compared favorably to former President Barack Obama, surged in the last few days of the campaign, following endorsements from Alexandra Ocasio-Cortez, the Democratic Socialist and Democrat Party nominee for New York’s 14th Congressional District, and from former Democratic presidential hopeful Sen. Bernie Sanders. But El-Sayed couldn’t pull out a win against more traditional Democratic candidate Gretchen Whitmer. Also supported by Ocasio-Cortez, Fayrouz Saad placed fourth out of the five candidates seeking the Democratic nomination for Michigan’s 11th District. The one outlier was a Democratic primary victory for Rashida Tlaib in Michigan’s 13th district. Tlaib faces no Republican challenger in the general election, virtually guaranteeing she will serve as the first Muslim American woman in Congress. The three candidates were the beneficiaries of campaign stops by Ocasio-Cortez, who attended a “Muslim Vote Matters” rally organized by Muslim political organizations Emgage and the Council on American-Islamic Relations (CAIR) Michigan chapter on July 31. Comparisons between Ocasio-Cortez and El-Sayed, Saad, and Tlaib were a repeated theme in media coverage. Ocasio-Cortez was accompanied by Linda Sarsour, a New York-based Islamist activist and Democratic Socialists of America Party member, who painted the potential election of three Muslim candidates as a blow to the Trump administration, which she said has fascist policies. 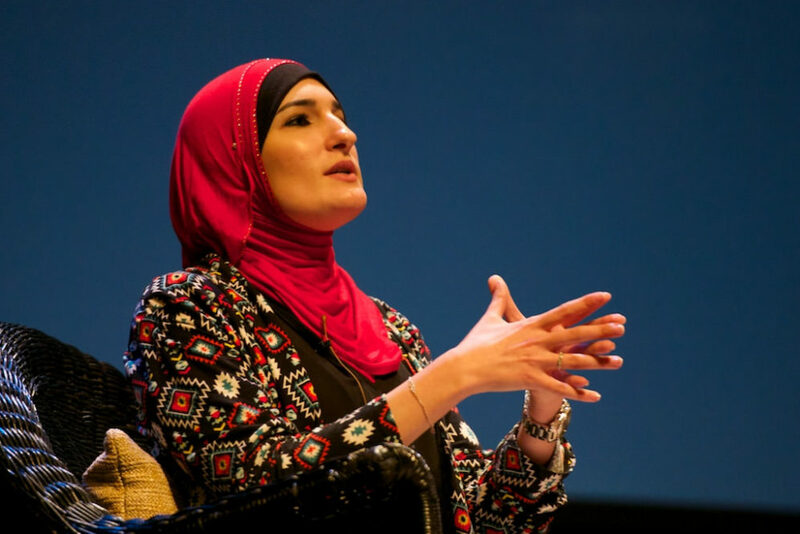 In the past Sarsour has drawn ire from both sides of the political spectrum after she called for a “jihad” against President Trump. She also faced criticism in The New York Times for her role leading the “Women’s March,” because she has a documented history of anti-Israel statements. The ties between the organizations named as supporting the rally, and their ties to the Muslim candidates lauded there, are substantial. Emgage was originally co-founded by CAIR alum and Florida lawyer Khurrim Wahid, under the name EmergeUSA. EmergeUSA got its political start raising campaign funds for former Democratic Rep. Keith Ellison, a long time CAIR favorite. Even before then, Wahid has a history of associating with Islamists. Wahid served as a consultant in the case of convicted Palestinian Islamic Jihad organizer Sami Al-Arian, according to an interview with Wahhid published by the Southern Poverty Law Center. Wahid was once reportedly placed on a terrorism watchlist. Emgage’s Michigan chapter is led by Nada Al-Hanooti, who was field coordinator for Tlaib’s 2012 Michigan state House campaign. Al-Hanooti comes from a family of active Islamists. She is the daughter of former CAIR-Michigan executive director Muthanna Al-Hanooti, who was sentenced to a year in prison after being convicted of sanctions violations amid accusations of serving as an agent of Iraqi dictator Saddam Hussein. Muthanna’s father, the late Mohammad Al-Hanooti, was an early co-founder of multiple Islamist organizations, and was suspected by the FBI of providing more than $6 million to the terrorist group Hamas. Candidate Saad served as board chair of Emgage-Michigan. Tlaib received an award from CAIR Michigan, appeared at a CAIR-MI protest, and headlined a CAIR Los Angeles fundraiser. El-Sayed’s father-in-law’s relationship with CAIR-Michigan became a source of tension during the campaign, when a Republican challenger highlighted it, together with CAIR’s ties to the Muslim Brotherhood and the terrorist organization Hamas—documented by the U.S. government in the Holy Land Foundation Trial. It’s not particularly surprising Ocasio-Cortez found common electoral cause with candidates who share common views on issues like U.S. relations with Israel. Ocasio-Cortez struggled in a recent interview after saying Israel “occupied” Palestine, and drew attention for condemning the death of 60 Palestinian protesters in recent border riots, the majority of whom were Hamas activists, according to the terror group, not innocent civilians. Last year at their annual convention, Democratic Socialists of America chanted the Israel-eliminationist slogan, “From the river to the sea, Palestine will be free,” which is commonly heard at pro-Hamas rallies. They also passed a motion endorsing the boycott, divestment, and sanctions (BDS) campaign. In addition to shared views on Israel, Islamists and the Democratic Socialists share a common challenge in seeking to mainstream their issues and rhetoric. The less-than-impressive outcome of the recent primaries—Politico Magazine titled its article discussing El-Sayed’s loss “Down Goes Socialism”—may warm the hearts both of establishment Democrats and Republicans alike. But irrespective of their immediate electoral fortunes, outreach by the democratic socialist wing of the Democratic Party risks legitimizing Islamist candidates, not just in this election cycle but in the future. American Muslims deserve every opportunity to participate in the American political landscape, without being treated as a singular voting bloc that can be delivered by Islamist organizations all too willing to insinuate they alone speak for the Muslim American voter. Judging the electoral future of Islamists in the United States from a handful of national-level candidates is bound to prove misleading. Ultimately, understanding the prospects of Islamists achieving political influence in America requires understanding how they mobilize at the local level. While Islamists may seek political power through the democratic process, and in alliance with other constituencies, the core of their ideology remains profoundly anti-democratic.